and the foghorn sounded through the early morning, a comforting thick blanket of time over the city. Thank you HG, so much to feel when there is really very little to see! It certainly was a sight! You sure get around Gotham!! In training for when I finally make it to the big outdoors of Texas! Excellent!! Can’t wait for that day!! Let me know when you’re thinking about it and I can help you plan out stuff if you’d like. That is dark and dense. I’m guessing there would have been more than the usual amount of traffic chaos as a result. You are probably very right about what it did to the traffic which is chaotic at the best of times. I am grateful I enjoy walking as much as I do! Very nice moody soft romantic shots. Something very poetic about them. That is so sweet of you to say, thank you Gerard. 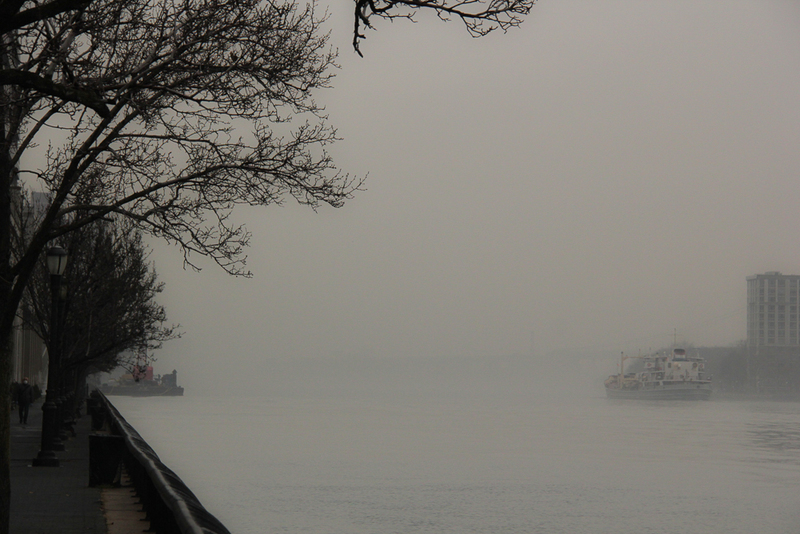 Perhaps fog brings the world in a little more around us, a comforting embrace of sorts . . . These images are priceless. You’ve captured the intensity of the fo along with the isolation. The bridge is my favorite. I for get is that the Manhattan Bridge. I know it isn;t the Brooklyn Bridge. look like they were painted in. It would look fabulous framed. Nice FOGGY MISTS !!!! Thank you so much Issy, it was lovely being out in the fog. 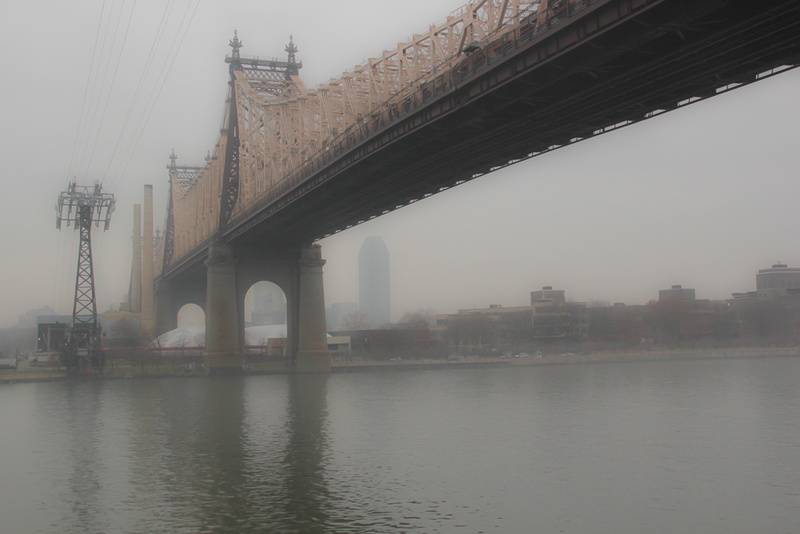 The bridge in #4 is the Queensboro, recently renamed the Ed Koch but I always think of it as the “feeling groovy” bridge from the Simon & Garfunkel track, The 59th St Bridge Song, that slow down, you move too fast song! WOW … I didn’t know they renamed it. I’m not surprised it’s now Ed Koch bridge. I was young when he was mayor. I would have to go back into my brain archives to see if I thought he was a good mayor. My hubby was a policeman during his terms. Speaking of hubby, he had said many times as we were walking over the bridge when we were dating(due to lack of money – going to Manhattan to the museums and N.Y.’s huge library) that he was going to buy me the BB. He did. On my 25th anniversary, he had a ring made for me that looks like the Brooklyn Bridge. It has the suspension in the middle and all. It is a priceless treasure. You always bring back so many wonderful N.Y. memories. Thank you for that. OOOpppsss … that’s supposed to be – in the far distance in the last photo – ooopppss … and, I don’t even text. What happens sometimes when you let your fingers do the talking, plus we can blame it on the fog which can be so disorientating! Amazing isn’t it what fog highlights while hiding so much. Thank you so much Potendono! Fog is so atmospheric for photos, I rarely have my camera with me or it lifts before I get out to take photos 😀 I like the two lights on the ship, and the contrast of the colour on the bridge with the soft grey fog is lovely. I know exactly what you mean about catching the fog before it lifts but this one stayed around for most of the morning which was such a bonus. Thank you RoughSeas for your comment, so lovely to hear from you! 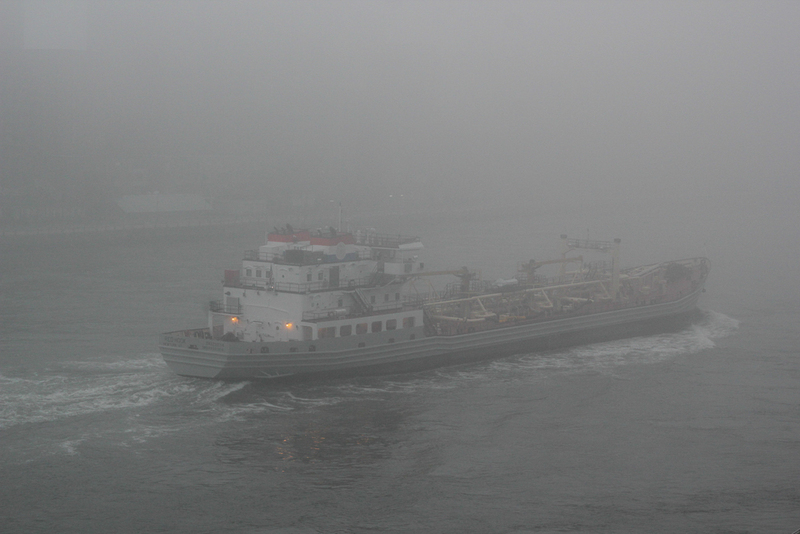 Oh, and I wish you could hear the foghorn from that boat in the first shot! These are great, Patti. I love making shots like these. The aesthetics are always incredible. To me, despite some meterologic understanding of dew point etcetera, fog is an imaginary supernatural phenomenon. It’s the lover of speculative fiction in me. I like to think that fog and mist are visual displays of spirits materializng. The ghosts move through places trying to cling to secrets they once had in life and may still hope to protect. Allan, I do hope you are giving some time over to your speculative fiction, bring the fog alive! What a great atmosphere, Patti! The images are wonderful. NYC is such a great city! I managed to make a stop there between the flights back from Buenos Aires to Berlin, I’ve spent one day there and I wished I had more time to enjoy everything. Well, for the next visit, Brooklyn is definitely on my list! Next time more time Anette and I just know you will get the best out of it! 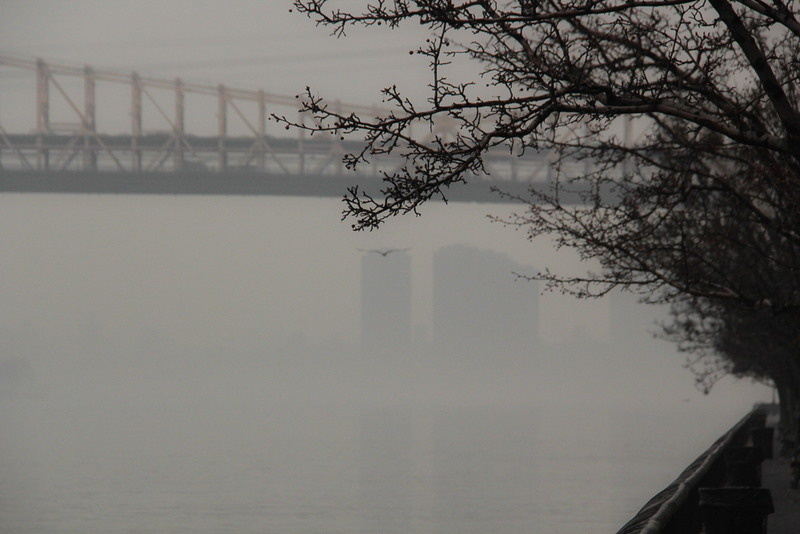 Great photos Patti…….As I remember it rare to see such fogs in New York…..and you caught it very well. Thank you Burgess! Do you remember times when the clouds were so low they almost kissed the ground? And ice floes down both East and Hudson Rivers? 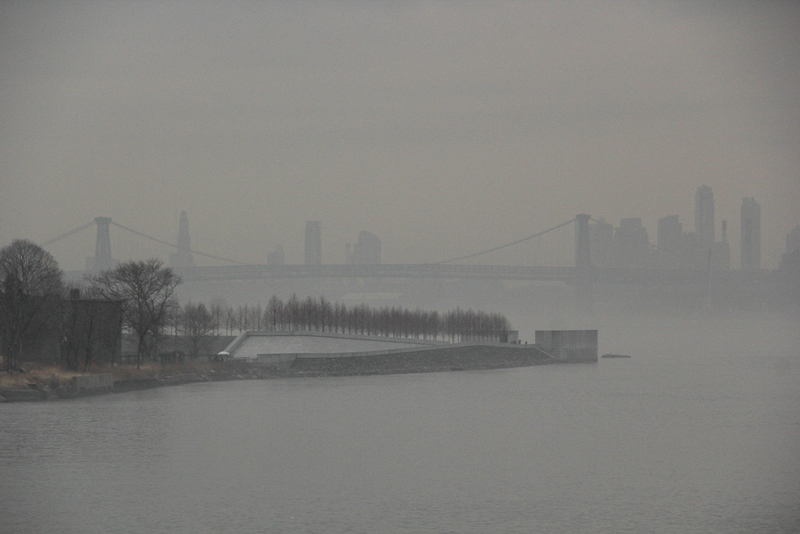 Beautiful – I love how the fog gives these gargantuan metal structures a look of delicacy and elegance. That’s a wonderful description, thank you so much Richard! Thank you Pat, the weather does put on a good show! Thank you Madhu, fog softens so much doesn’t it! I love these Patti. And your comment above that you think of the Queensborogh (ED Koch?! Sorry!) as the “Feelin’ Groovy” bridge, too. Perfect. Gorgeous shot! They renamed the bridge while Ed was still alive and able to take advantage of the photo op! As with anything to do with Ed, feelings were more than mixed about taking the good name of Queens from the bridge (the Brooklyn Bridge would never get a re-name, unless of course the outgoing mayor plans on leaving behind a generous donation to the city in return for the Bloomberg Bridge!). Thank you Lyn for your kind words, always great to hear from you! These are gorgeous, Patti. My fav is the second one with the bird – a gull? What a shot. The bird shot and the bridge shot – both amazing. Ba ba-ba ba, ba ba… feeling groovy! Great shots. Love the bird, too. Were these with your new camera? These are absolutely terrific Patti with such great compositions. My personal favourite is the last ethereal image of the bridge spanning the river. Fantastic photos. I love fog! I especially like the first photo of the barge. Great feeling to these photos. These are all wonderful, but #2 sums it all up for me. More than one string to your bow, eh, Patti? So beautiful and dreamlike..with a touch of majesty. You add your own flavour always too, just love it. Magnificent foggy captures. Each composition is a gem. Beautifully composed Patti – a timeless feel to them all. I agree that the enveloping nature of fog is somehow comforting. Perhaps it is because we don’t have to face everything at once.